We’ve all dealt with the unpleasant experience of an inflated travel bill, whether it’s getting socked with extra fees at the airport or discovering fine-print charges for a hotel room. Being an active and aware consumer, however, can protect you—and your wallet. Read on to discover the 10 worst travel rip-offs currently plaguing the industry, and how you can avoid them. A few weeks ago, Spirit announced it would begin charging for carry-on bags, to the tune of up to $45 per bag. Since then, the industry has been in an uproar, with five other airlines pledging not to add similar fees on their respective flights. The pushback is obvious—not all travelers take baggage, but most travelers have at least one carry-on. Add a price tag to the carry-on and you challenge even the lightest of travelers. As for the argument that charging for a carry-on will reduce boarding and deplaning times, well, it remains to be seen if this new fee will result in increased efficiency at the airport. To me, it just sounds like creative justification for hitting travelers with a new (and nearly unavoidable) fee. To avoid a carry-on bag fee, the strategy is simple: Don’t fly Spirit. While we’re on the topic of bags, let’s consider the relatively new development of airlines charging for checked bags. American was the first carrier to do so in May 2008, and many carriers quickly followed suit. What started off as a seemingly bad idea (for customers, natch, not the airlines) unfortunately turned into an industry standard. Two years later, there remain just two lonely standouts that don’t charge customers for their baggage: Southwest (two checked bags free) and JetBlue (one checked bag free). Why are baggage fees a rip-off? Simply put, the act of traveling typically necessitates a bag. Of course, you can be creative and try to pack as light as possible, but for most people, taking a trip longer than two days will require a suitcase. Given that the fees aren’t insignificant (ranging from $15 to $45 for the first checked bag), the extra charges for such basics can really add up. To avoid paying for bags, you could limit your air travel to Southwest and JetBlue, or you could strive to travel light and only pack carry-on bags when using other airlines. You could also investigate the cost of shipping your belongings ahead to your destination, as well as back home, a few days before your departure and return. This pricing discrepancy in the airline industry is downright sneaky. For example, check a bag with Continental, Delta, or United at the airport and it’ll cost you $25. Do so online, though, and it’s slightly cheaper—$23. US Airways charges $25 for an in-person baggage check or $20 to check a bag online. The airlines are passing on their costs of having to employ customer service reps, baggage personnel, and the like to you, the customer. Use those employees and their services by checking a bag at the airport and it’ll cost you. This difference in fee pricing is discriminatory to those without Internet access, as such customers are penalized in the pocketbook simply because they’re not online. The best strategy is to use the Web as your default for all travel purchases. If you’re skittish about booking online, plan on putting in a good amount of preliminary research to ensure you won’t be penalized by booking in person or over the phone. SmarterTravel columnist Ed Perkins considers full-fare coach/economy class seating a big rip-off, as you’re paying “top dollar for a lousy product.” Now, let’s add insult to injury—extra charges to choose that lousy coach seat in advance. Currently, coach seat selection fees are in place with AirTran and Spirit. With most other airlines, you can choose your seats in advance without paying extra on your final ticket cost. And why not? This is what you’re purchasing. I can think of few other industries where picking out your exact product results in a surcharge. It’s like an extra fee for test driving a car, or one for handling which apples you choose to purchase from the supermarket. In other words, a rip-off. If you don’t mind a random seat assignment, forego choosing your seat in advance with AirTran and Spirit to avoid the fee. Or, conversely, avoid these fees altogether by choosing competitor airlines. Here we have another case of the airlines charging for items that used to be included in the price of your ticket. Nowadays, with “unbundling” being all the rage, you can expect to pay up to $12 for a kit including a small pillow, blanket, and earplugs, and a buck or two for headsets. Essentially, the charges here are born of convenience—you’re paying because you’re in the right spot at the right time. Truly, can you think of any other scenario in which you would shell out up to $12 for what is essentially a square of fleece and a static-cling pillow? You’re better off packing your carry-on bag wisely and including your own fleece, pashmina or scarf, sleep mask, and pillow—you’ll get higher-quality products and a more restful experience. Accrued miles on US Airways? Try to book a flight using your frequent flyer miles and you’ll be charged anywhere from $25 to $50 just to redeem your “reward.” This extra fee negates the “free” element of reward travel—you’ve upheld your end of the bargain by being loyal to your airline, but when you ask the company to uphold its promise of a free flight for your efforts, you get slammed with a surcharge. If it sounds unfair, that’s because it is. While most other airlines will let you book award travel for free online, try to do so in person or over the phone and it becomes a different story. A whopping 11 domestic airlines charge frequent flyer redemption fees for non-online transactions, and the penalties range from $15 to $40. Bottom line? If you’re going to book award travel, do so online—and if you’re traveling with US Airways, consider switching your loyalty program to a different carrier. The collision-damage and loss-damage waiver insurance on rental cars may not be necessary. In many situations, your own insurance provider and credit card offer similar protections in the case of damage or theft. Contact your car insurance and credit card companies to determine your current coverage. Once you’ve determined that you have the insurance you need, you can decline these extra charges with confidence that you’re not paying twice for the same services. There are many rip-off fees associated with credit card use nowadays, but among the worst may be surcharges for purchases/exchanges on foreign soil. The 2 percent fee is small, but it’s a fee for doing absolutely nothing. The best way to work around this gouge is to limit the times you use your card while overseas. Make fewer credit card purchases, and consider cash instead. ATM debit cards often have better exchange rates and minimal fees—just make sure you safeguard your currency if employing this method. Add-on fees are the ones that most commonly get you by surprise—common-sense items or services that you thought you were already paying for when you booked. These add-on fees can include daily “resort” or “housekeeping” costs at hotels, licensing or other usage-related surcharges on rental cars, and (perhaps the worst of all) fees just to make a transaction in the first place. To avoid unpleasant surprises such as these, be sure to read all fine print up front before you book. Check the travel provider in question on user-review sites and consumer-protection agencies (such as the Better Business Bureau). 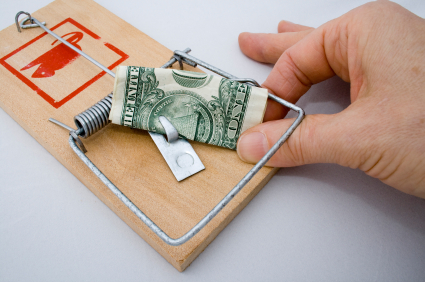 If you can avoid these companies entirely, then you won’t be subject to their rip-off fees. Nowadays, many consider the Internet to be a utility, as essential to your hotel stay as running water and electricity. Indeed, many hotels have recognized this and include high-speed wireless Internet access in the guest room rate. Not all do, however, and without reading the fine print, you might pay up to $14.95 per day for the privilege of using the Internet in your hotel room. Others may offer free Internet access only in public areas, and you’ll get charged if you log on in your room. If you’re a frequent business traveler or just like to stay connected during your vacation, call and ask the front desk clerk if there are fees to use the Internet. If so, you might want to consider taking your business elsewhere. Have you ever been taken for a ride—literally—while traveling? Share your worst travel rip-off experiences by leaving a comment below!